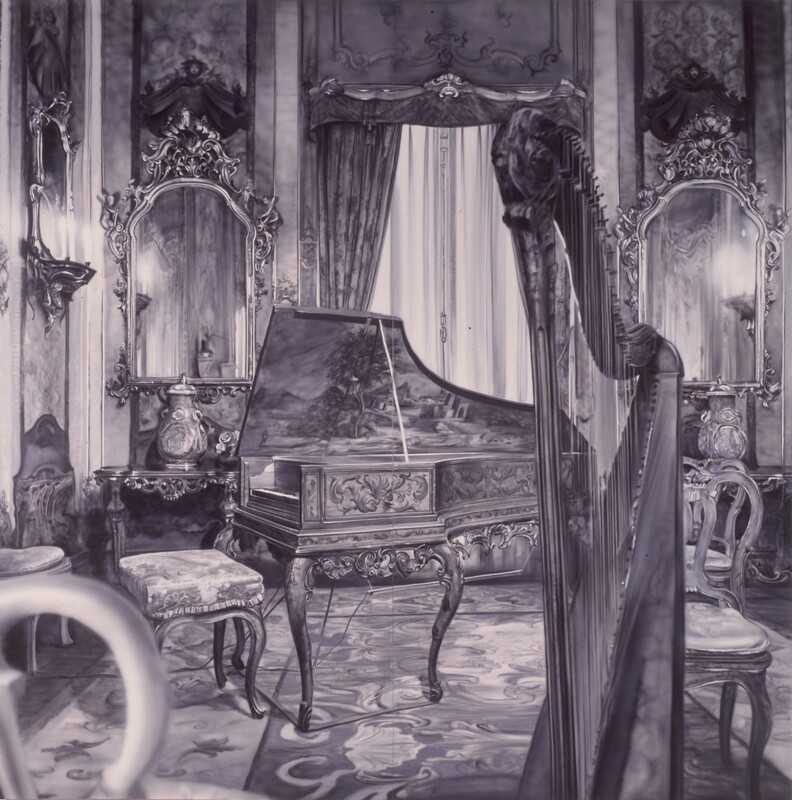 From a busy photo taken of the music room at Vizcaya in Miami, thirty works on paper were done before the realization of a series of eight-foot high paintings, which envelope the viewer in various aspects of the subject. 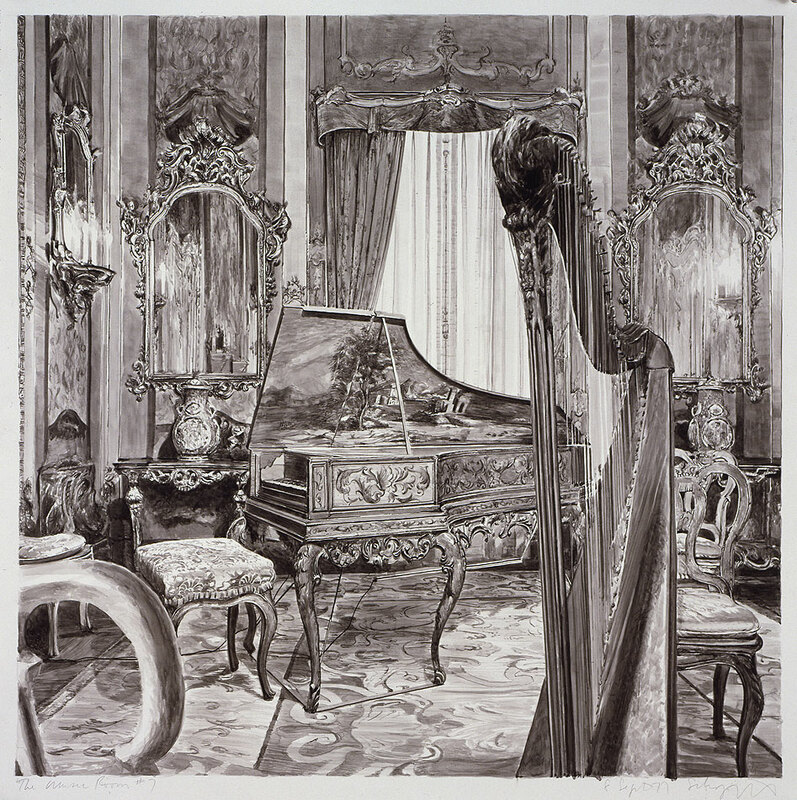 The Music Room Working Drawing, 1978. Mixed Media on Paper, 16" X 40". 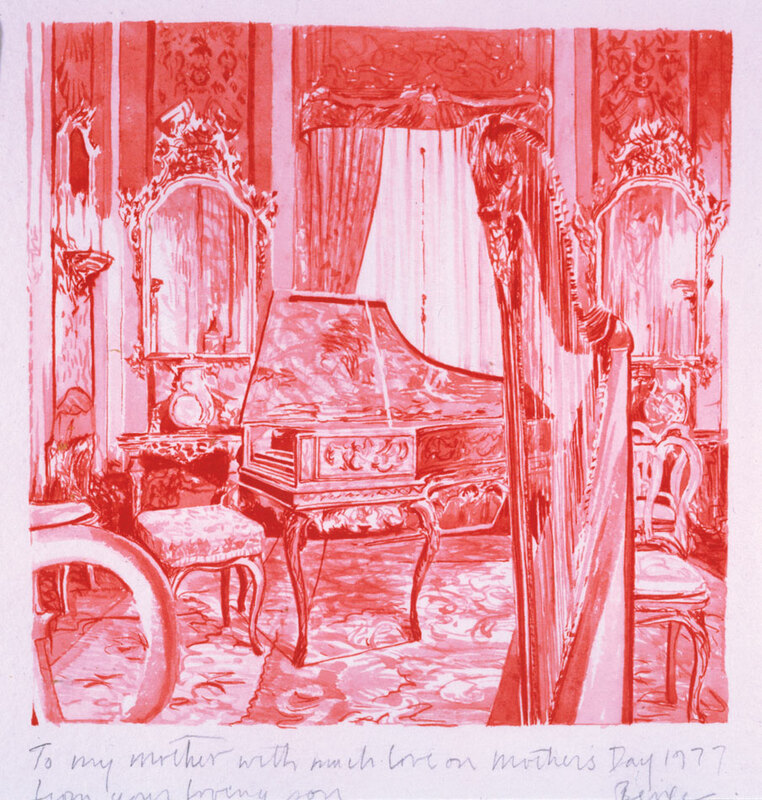 Mother's Day Card, 1977. Watercolor on Paper, 7.5" X 8.5". 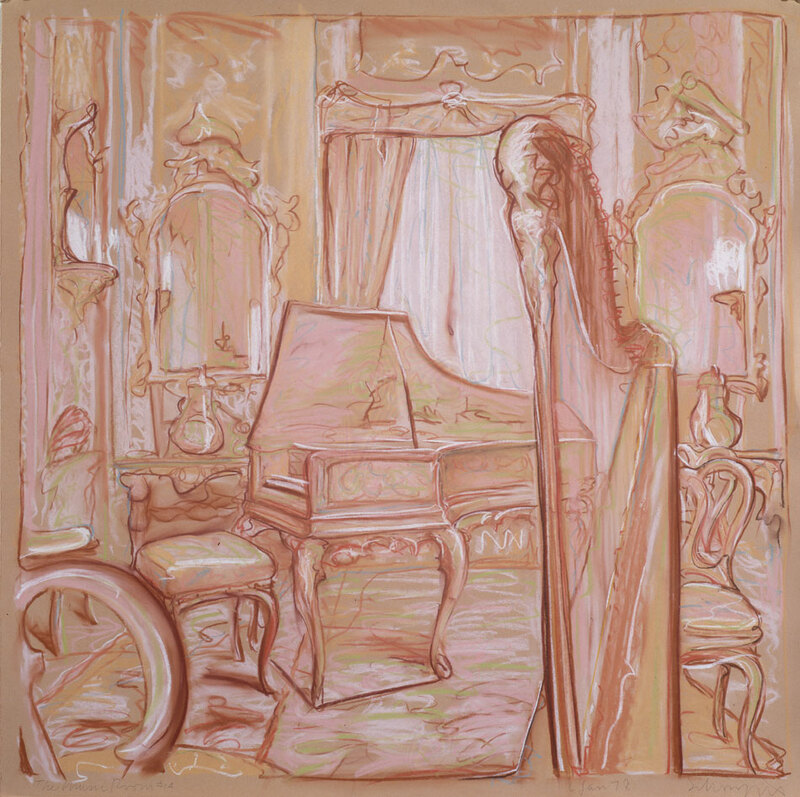 The Music Room, Double Harp, 1977-78. Oil on Canvas, 96" X 48". 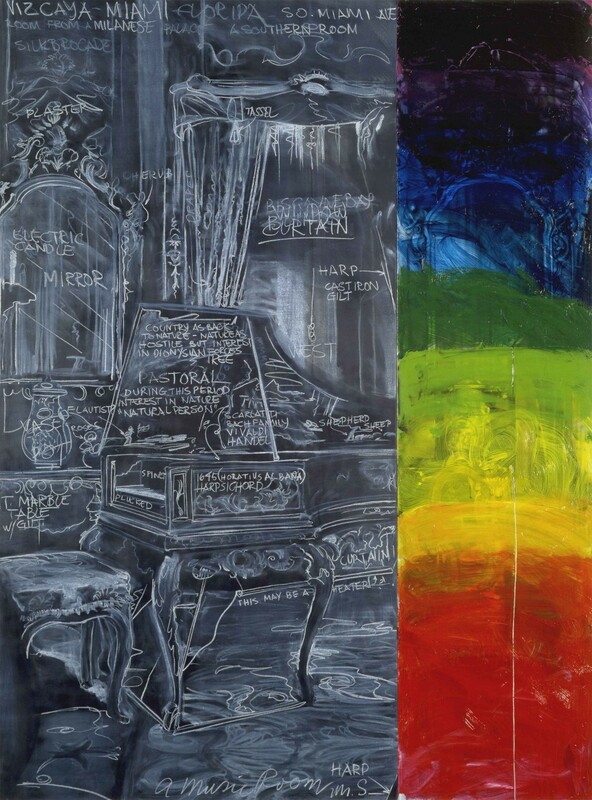 The Music Room, Blackboard Diptych, 1977-78. Acrylic & Pastel on Canvas, 96" X 72". The Music Room, Magna, 1977-78. 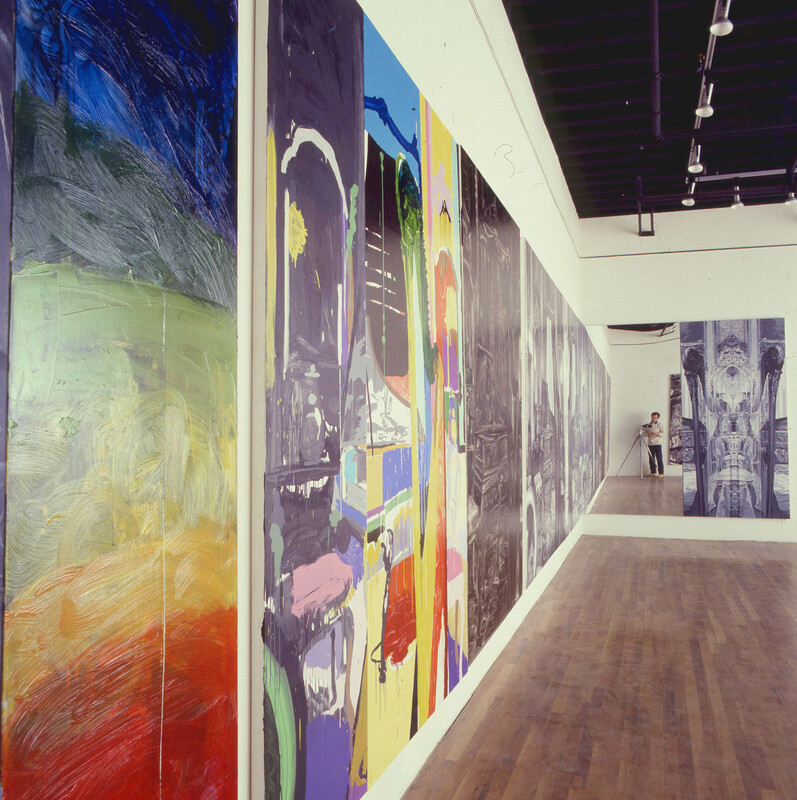 Magna on Canvas, 96" X 144". 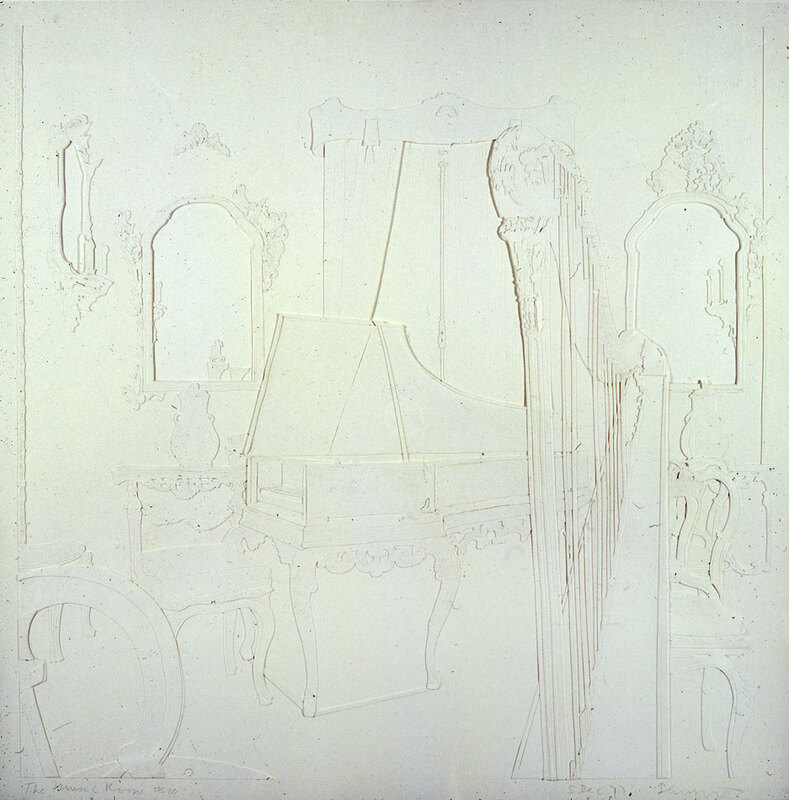 The Music Room, Left Panel of Diptych, 1977-78. 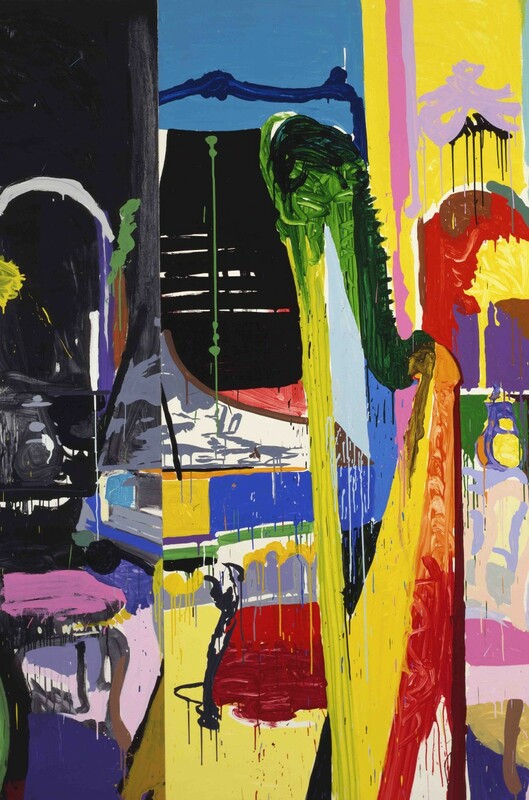 Oil on Canvas, 96" X 192". 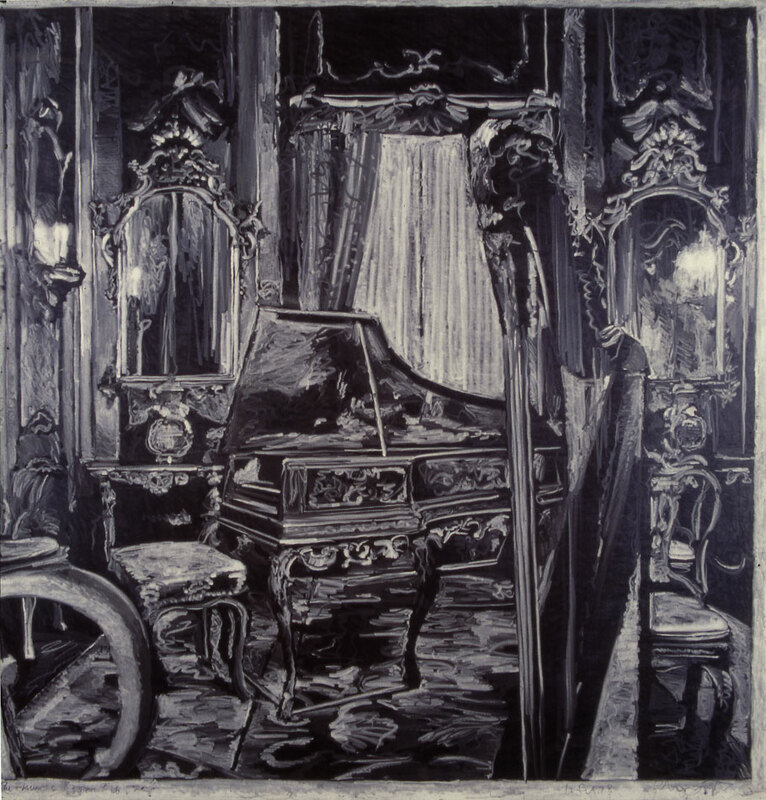 The Music Room, Right Panel of Diptych, 1977-78. 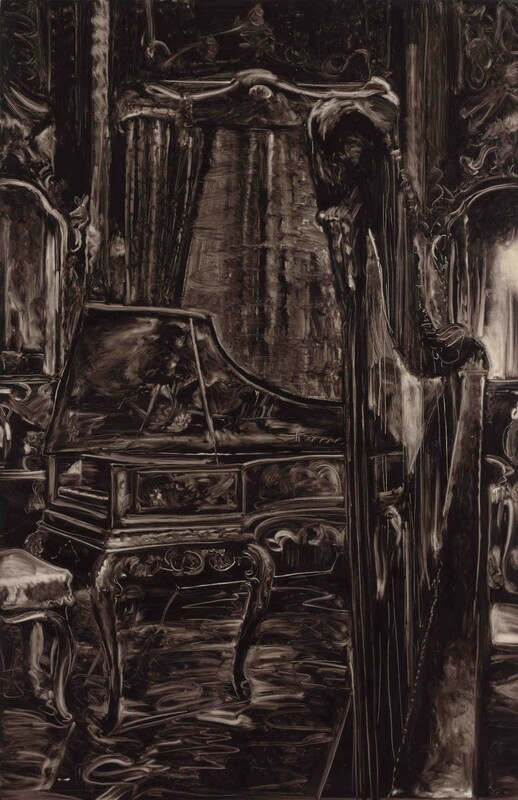 Oil on Canvas, 96" X 192"
The Music Room (B&W), 1978. Oil on Canvas, 97" X 64". 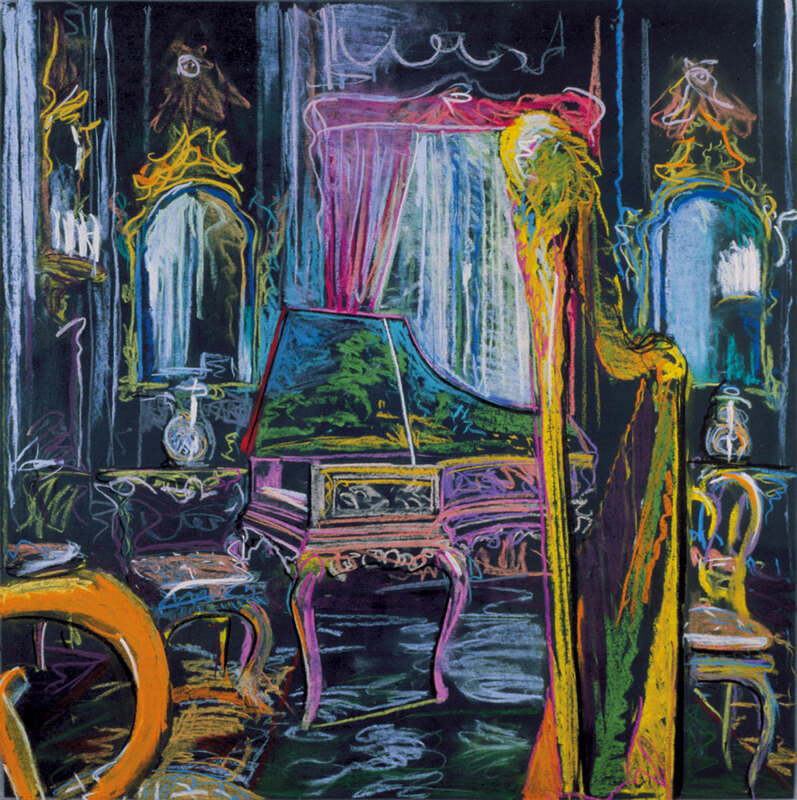 The Music Room (Colorful), 1978. Diptych, Acrylic on Linen, 96" X 72". 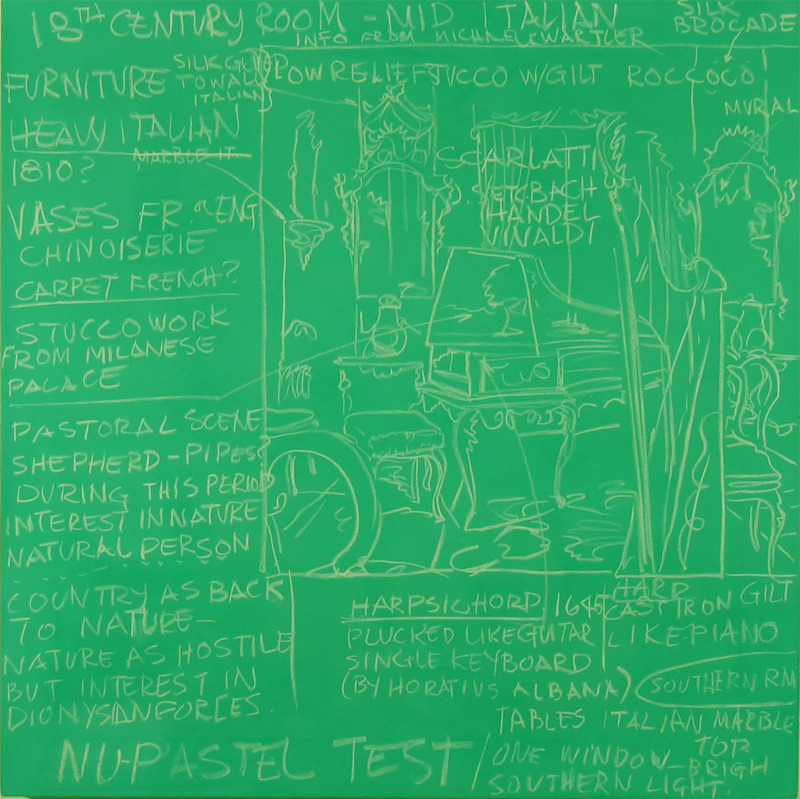 The Music Room (First Blackboard), 1978. Pastel on Acrylic on Canvas, 33" X 33". 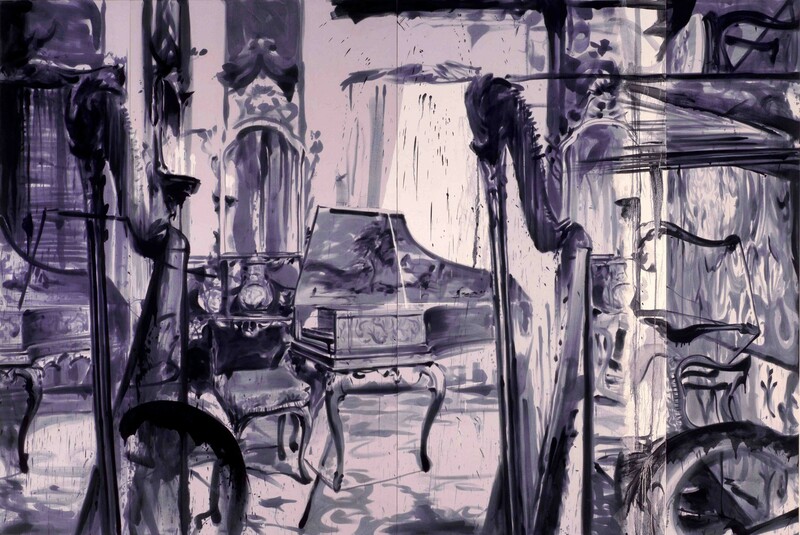 The Music Room #1, 1977. Watercolor on Paper. 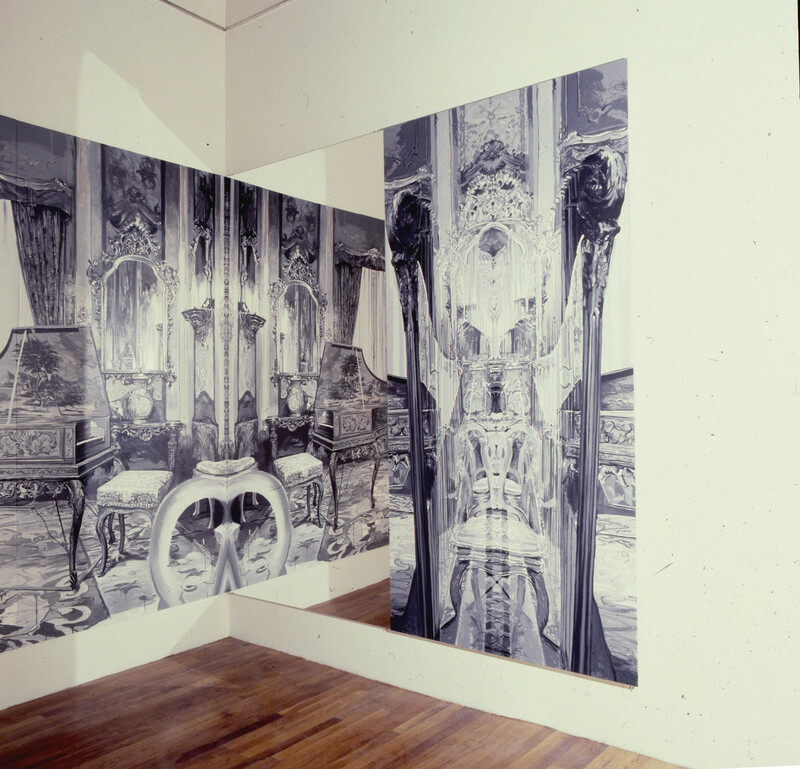 The Music Room #3, 1977. Pain Stick, 30" X 30". 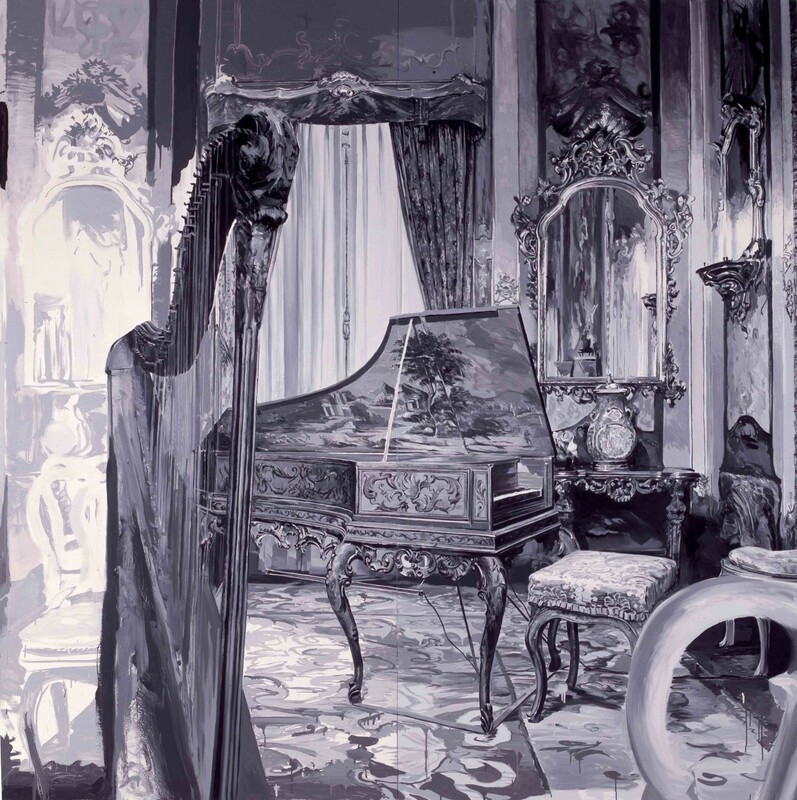 The Music Room #4, 1978. White Paint Stick on Black Paper, 30" X 30". 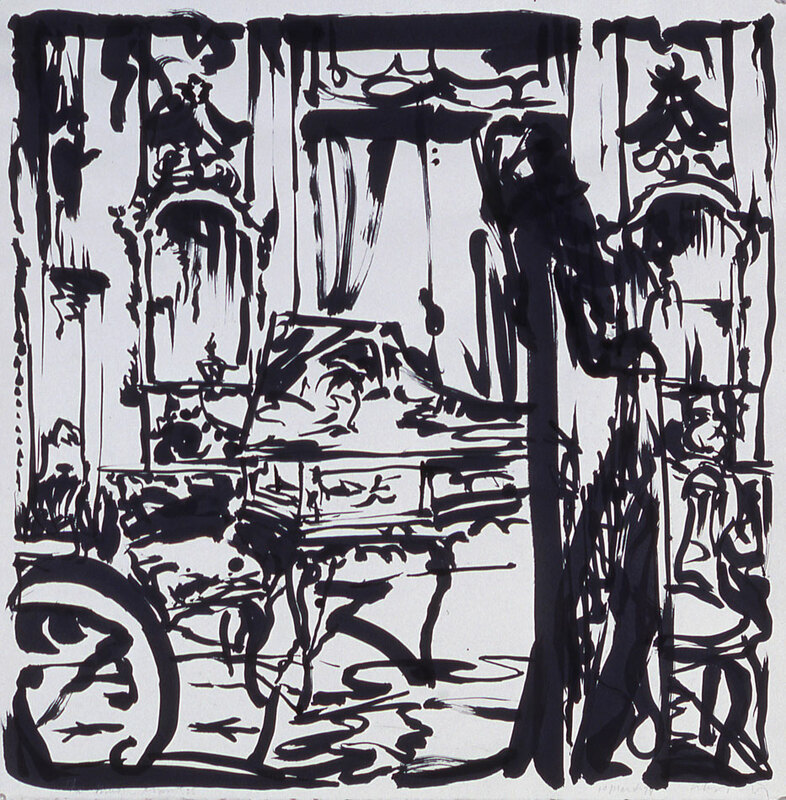 The Music Room #7, 1978. Watercolor on Paper, 30" X 30". 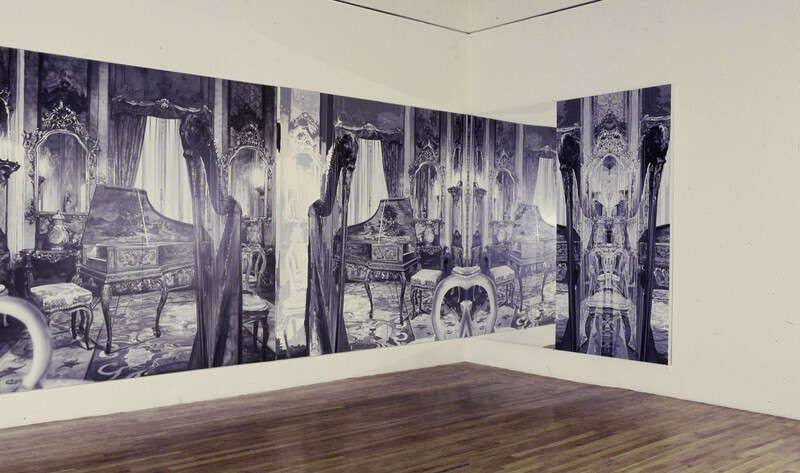 The Music Room #8, 1978. 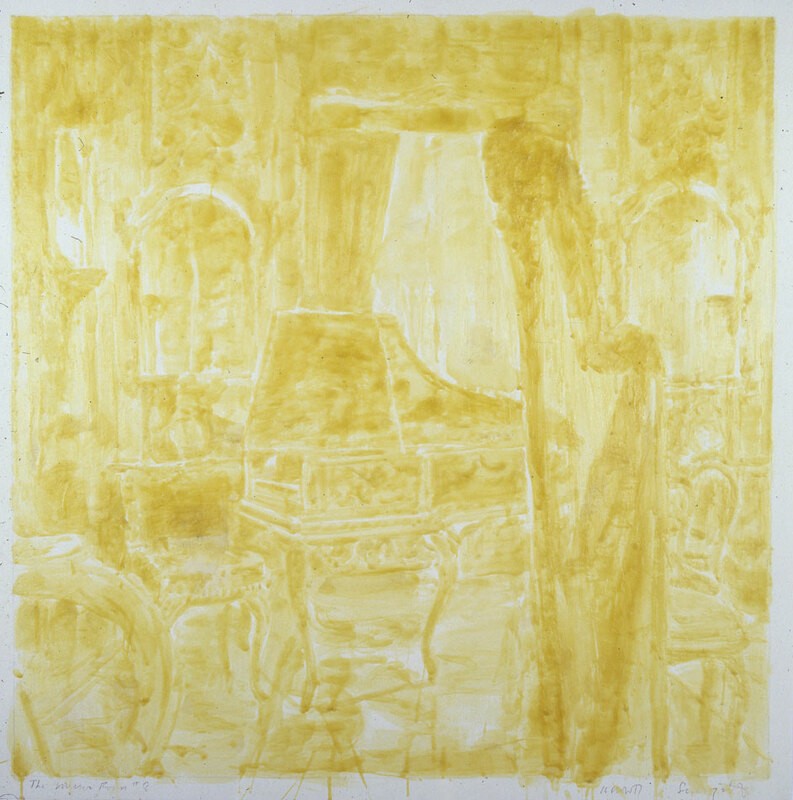 Bee's Wax on Paper, 30" X 30". 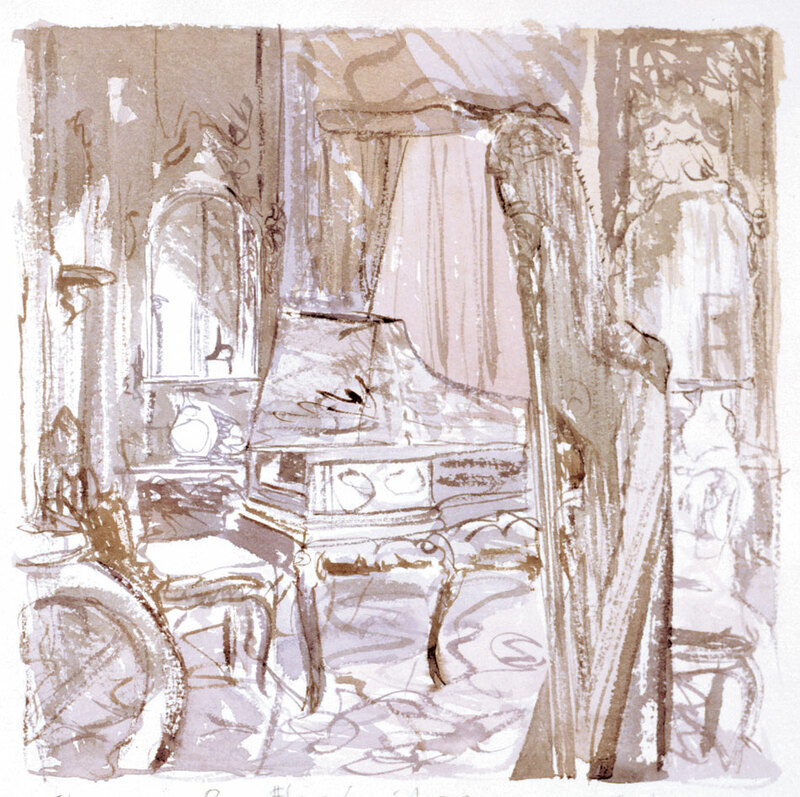 The Music Room #10, 1977. Relief Collage, 30" X 30". 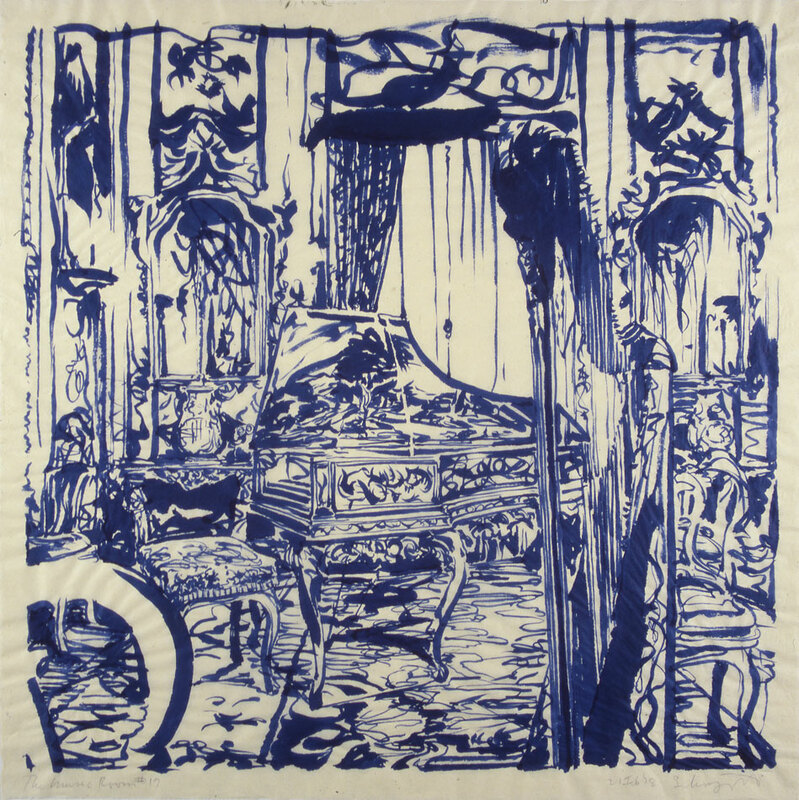 The Music Room #12, 1978. Pastel on Gouache on Paper, 30.25" X 30". The Music Room #13, 1978. Pastel on Acrylic on Paper, 30" X 30". 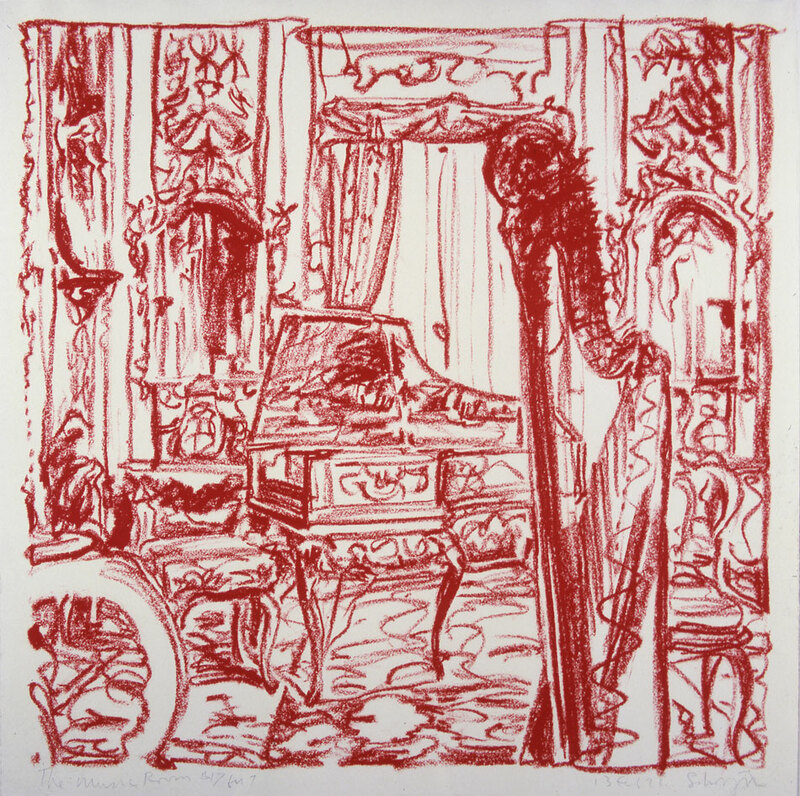 The Music Room #14, 1978. Pastel on Paper, 30" X 30". The Music room #16, 1978. Carcoal on Paper, 30" X 30". 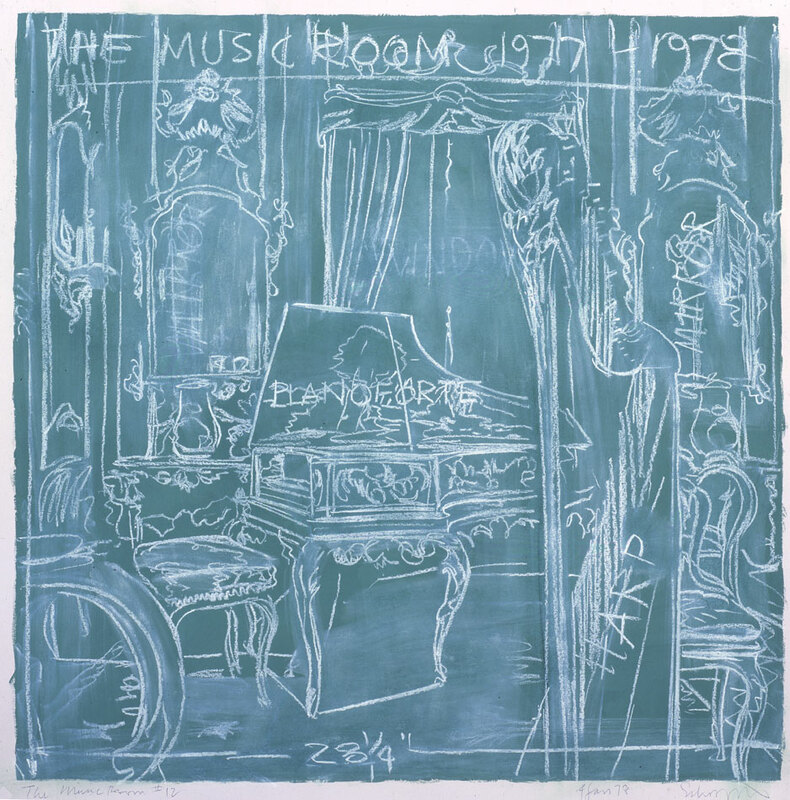 The Music Room #17, 1978. Crayon on Paper, 30" X 30". 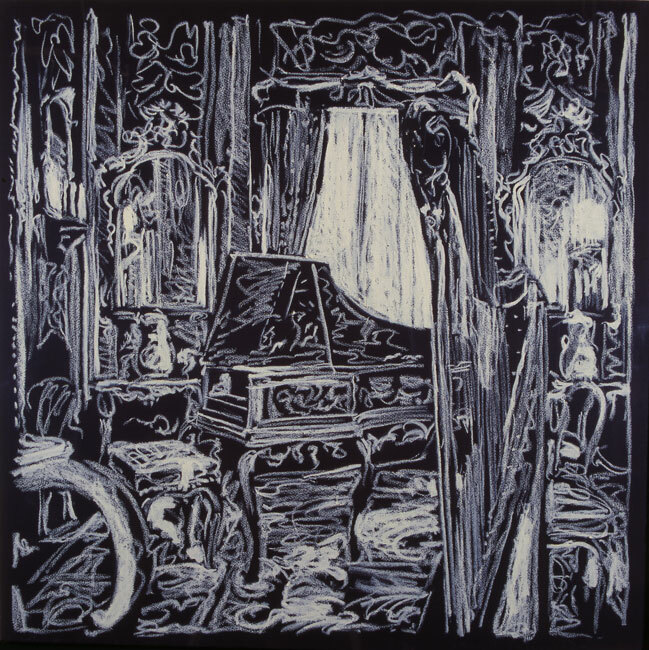 The Music Room #19, 1978. Ink on Paper, 30" X 30". 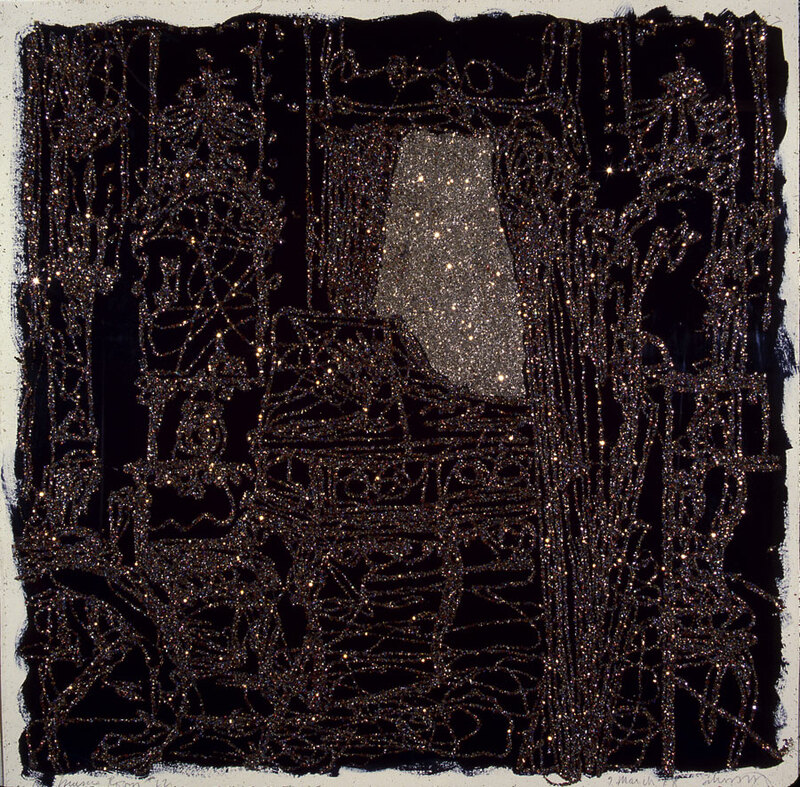 The Music Room # 22 (Glitter), 1978. Glitter on Acrylic on Paper, 30" X 30". 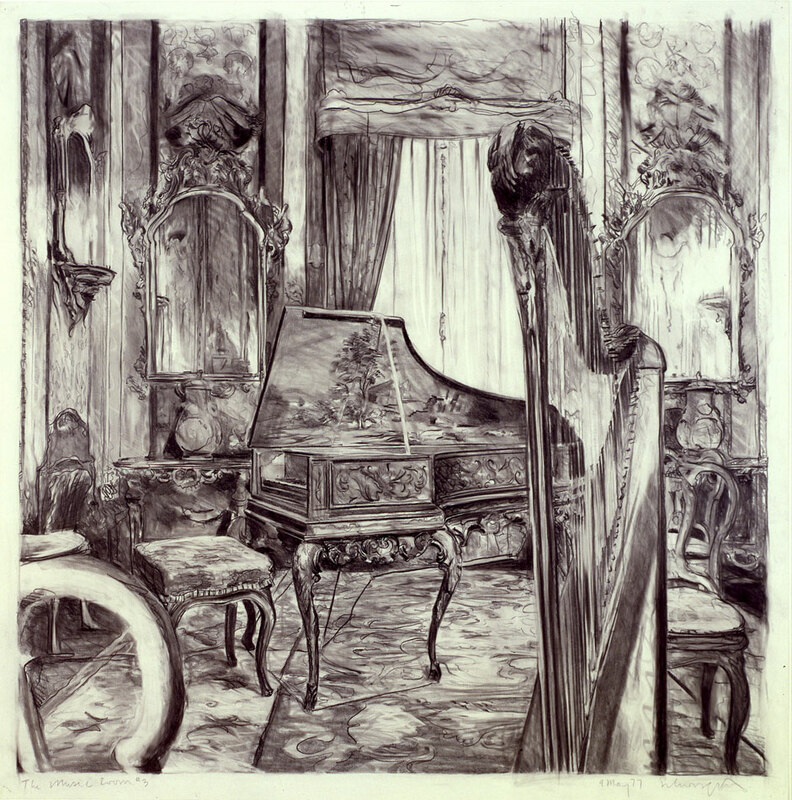 The Music Room #23, 1978. 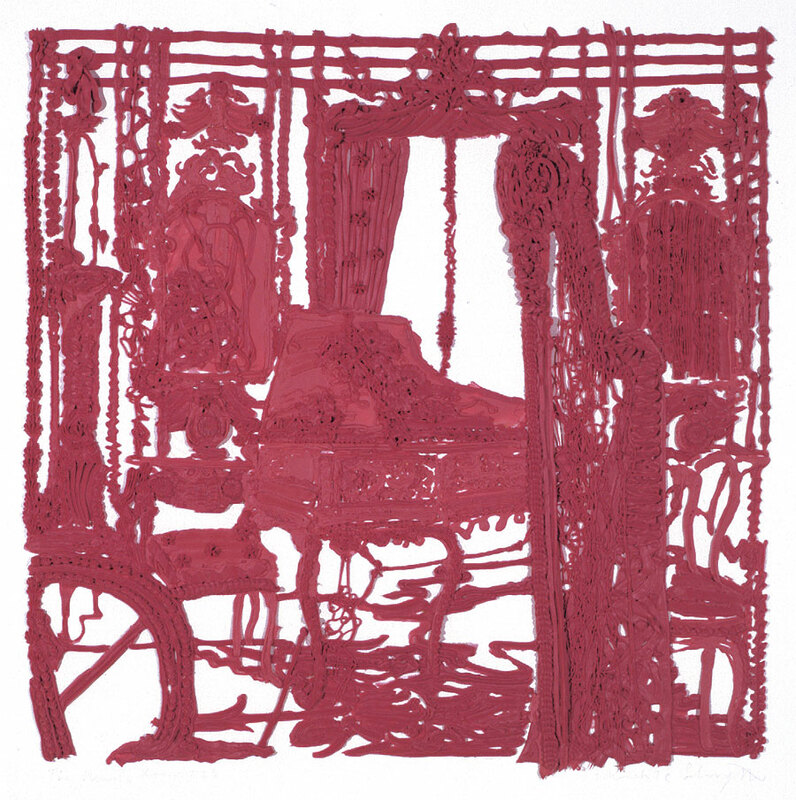 Pink Moulding Paste on Paper, 30" X 30". The Music Room #25, 1978.